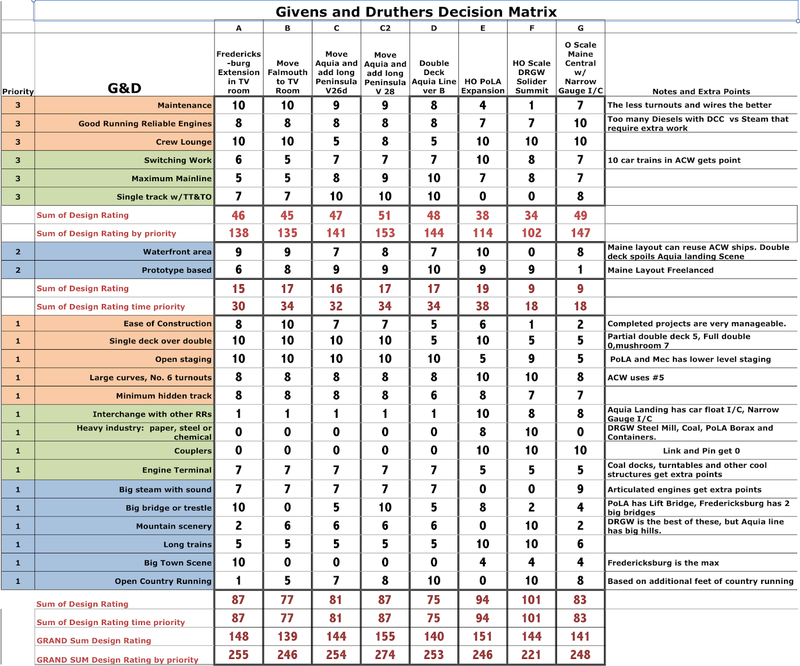 I reworked the decision matrix to group the G&Ds by priority. This allowed me to better understand which G&D's were contributing to the scores. With the G&Ds grouped by priority, it became apparent that the crew rest area and mainline run for TT&TO were a key points. The Fredericksburg extension scores well by having a good crew lounge and high scores on several lower priority G&Ds. So, how can I design a layout that includes a decent crew lounge while also having a maximum mainline and all stations with double ended passing sidings. All of those are high priority items. While I'm at it, how about another big bridge? I decided to try a plan with a large pit by Falmouth. 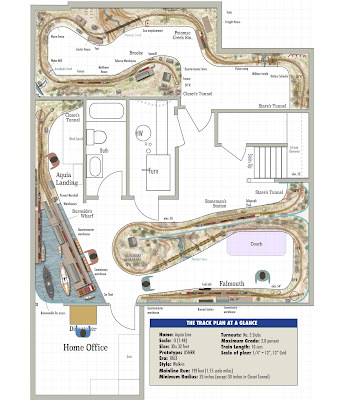 The idea for this plan came from sketching other O scale standard gauge plans with large minimum radius. Those plans have huge turn-back loops and pits that can repurposed. How about doing that here? I rotated Aquia Landing into lower left corner. This creates a really deep scene, in an area where the backdrop is already painted with a scene I really like, I don't want to lose that. But where to put Burnside Wharf? I went back to an earlier idea I examined where Burnside Wharf is a single track along the back wall. It will be hard to access, so cars on that wharf will have to remain coupled. I can add an access pit behind the main wharf for emergencies and maintenance. There is the option that Burnside's Wharf could be extended into the home office with this plan too, but I don't expect to do that. One thing we have found in op sessions is that the third yard track at Aquia landing is rarely used. So this plan uses that track as a lead to Burnside Wharf. The other tracks create a long double ended siding with two crossovers. There is a stub siding to park the passenger and mail cars. The wye is gone and replaced by a turntable, which I conveniently have already built. The aisle by the turntable is tight due to my work shop. But that is the case for all the plans I considered. On the other side of the room is Falmouth. In this plan Falmouth and Aquia landing no longer share an aisle. I think this arrangement gives a better sense of "going somewhere." The mainline run is good too, with 193 feet, about 1.75 scale miles, or about 27 design train lengths. There is minimum hidden track, less than 11% is hidden. The crew lounge shares the aisle with Falmouth. The aisle here is seven feet by 15 feet, that's the size of a small bedroom. The old saying about the aisle is the cheapest design feature in a model railroad applies. To make the couch fit better, the central peninsula climbs to 54 inches. So folks that sit on the couch will not hit their heads on the overhanging benchwork. For added wow factor, I added a large trestle on the central peninsula. This is essentially the same bridge I planned for the Fredericksburg extension, though I would build it like the famous bean pole trestle. The nice thing about putting it in the location shown on the plan is that it can travel over a 15 inch deep gorge without interfering with anything below it. The creek here would be named Mueller's Run in honor of fellow ACW modeler, Al Mueller, who passed away late last year. I added drawings of some operators in scale. With two trains running and a dispatcher. you can see that the basement is not crowded. Adding a third train as an extra will not crowd things too much. I will adjust the schedule to match the new distances. No longer will there be meets at Brooke. Most scheduled meets will be at Potomac Creek or Stonemans. No changes will be needed for the telegraph system. I will need to build some more freight cars, but no new engines would be needed. Going back to the matrix, this plan has the top score, by a big margin. It pays to game the system. Should I stop track planning now? Have to wait until 2019 NE Interchange in November. Then all hell breaks loose. Looking forward to helping make it happen. Like the elevation change to Falmouth. You could even do a dip down to Stoneman's with a steeper climb over the couch or a rise after the stairs continuing up the peninsula to more than 54" and then downhill into Falmouth at 54". But I don't have a good feel for the height of the rest of the layout. Just thinking out loud so to speak (or is it type???). I'd consider moving potomac creek station further down the line to give you an opportunity to build the full sized potomac creek bridge but other other than that, this is a real winner.